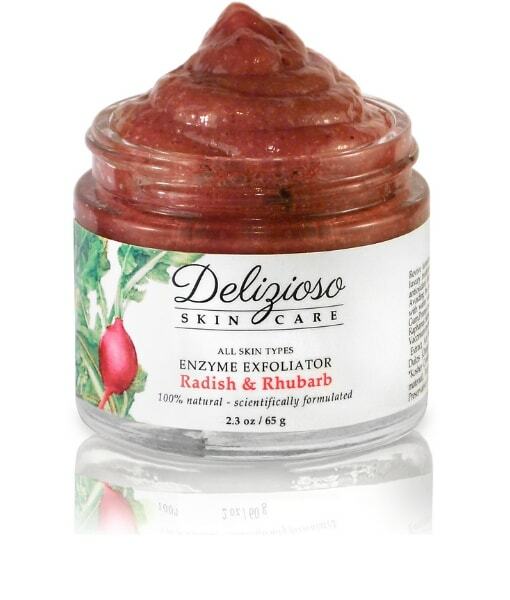 This gentle facial exfoliator is rich in Rhubarb and Pineapple Extract. Rhubarb contains lots of Vitamin A, which is a natural antioxidant. Antioxidants are known to help to neutralize free radicals in your skin, thus delaying symptoms of aging and cellular damage. The deliciously luxurious facial polish is rich in vitamin C and bromelain which comes from pineapple juice, making the polish also effective for improving the appearance of blemishes. The gentle exfoliator will help slough off dead skin cells, leaving skin feeling fresh and revived. *Aloe Barbadensis Leaf Juice, Xanthan Gum,Prunus avium (Cherry) Kernel Oil, Rheum Rhaponticum (Rhubarb Root) Extract, Beta Vulgaris (Beet) Root Powder, Raphanus Sativus (Radish) Seed Extract, Carica Papaya (Papaya) Fruit Extract, Ananas Sativus (Pineapple) Fruit Extract, Vaccinium myrtillus (Bilberry) Extract, *Citrus Medica Limonum (Lemon) Extract, *Saccharum Officinarum (Sugar Cane) Extract, Acer Saccharinum (Sugar Maple) Extract, *Citrus Aurantium Dulcis (Orange) Extract, Sambucus nigra (Elderberry) Fruit Extract, *Kosher Certified Flavor Oil blend (Naturally derived from plant/fruit material), Tocopherol (Non GMO Vitamin E) and Natural Antioxidant Preservative (Vitis Vinifera (Grape) Seed Extract, Populus Tremuloides Bark Extract, Leuconostoc/Radish Root Ferment Filtrate, Sambucus Nigra (Elder) Fruit Extract). This exfoliator smells really very good. I want to eat it! It looks like jam. I use it every morning and evening and it is in fact gentle. Keeps my skin very vibrant. I am excited to try more of the line. I’ve been using this exfoliator for about 2 weeks now and I LOVE it. Not only does it smell great (good enough to eat) but my face is so much smoother now. On the days I use it my face feels like I just left the salon after a facial…without the price of one! And, it is keeping my adult acne under control as well….two for one! Smooth skin and clear skin. Thank you so much for making a natural product that does so much! The Radish & Rhubarb exfoliator is excellent and I am using it daily alongside the Carrots & Buriti and Ocean Kelp mud mask once a week. This combo is the most beautiful and deep cleansing experience I have ever experienced. It leaves my face silky with so much hydration and sparkle! Gently Exfoliating & Smells so Good! I purchased this product along with the Lucuma Regenerating Serum in attempt to fade hyper-pigmentation from acne scars & to help with congestion. I use this before cleansing. This enzyme exfoliator lasted me about 4 months, using once a day every other day. Smells sooo good, only a little is needed for face, so gentle; my face is de-congested & soft as baby skin! This has helped me so much that I will be re-purchasing a second jar, just lovely.